Pickapeppa Sauce: This mellow, slightly sweet Caribbean condiment has been called the Jamaican ketchup. The blend of tomatoes, mangoes, raisins, tamarind, and cane vinegar makes an excellent marinade for grilled chicken and pork. Look for it on the international aisle. Combine chicken, Pickapeppa sauce, and garlic in a large zip-top plastic bag. Seal bag. Refrigerate 2 hours. Preheat grill to medium-high heat. Remove chicken from marinade; discard marinade. 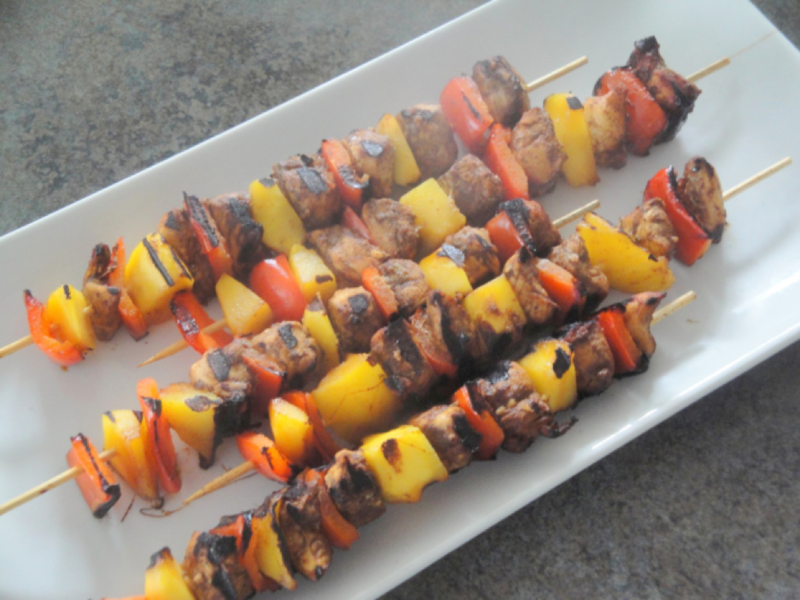 Thread chicken, mango, and red bell pepper ­alternately onto each of 8 (12-inch) skewers. Place skewers on grill rack coated with cooking spray; grill 10 minutes or until chicken is done, turning ­occasionally.